Titus House: Where I continue to regale the world with more photos of hidden stairs under the back addition. 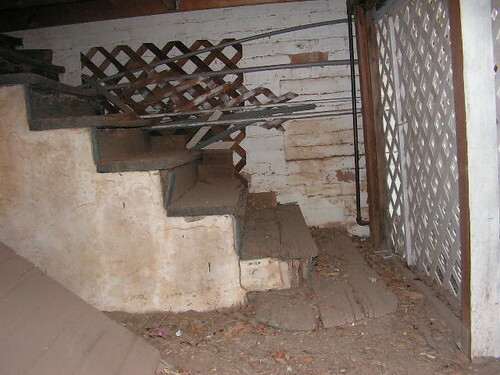 Where I continue to regale the world with more photos of hidden stairs under the back addition. OK, my In-laws have returned home and we can get back to working on the house, if Kaptain KAOS is still around. In an effort to bring myself back among the living at least in houseblog land I am bringing this to the story of casa titus. This is a picture opposite the stairs leading to the kitchen, they are at the back entrance and next to the stormcellar/servants entrance. Again, you can see the window behind them, or at least the trellis someone stuck there for some reason... I am fond of the bottom step as it is rather pretty. I still don't know if this would be original to the house, I still have not unpacked the box with the historical data we have which includes some photos from back in the day... I think it was all wood though, which would make sense as this looks plastered. camera phone 006, originally uploaded by Blair Necessities.